I was going to write a post last night promising not to make too big a deal out of today’s job numbers, no matter what they turned out to be, but I forgot. But I promise anyway. As it happens, new jobs clocked in at 115,000 last month, only 25,000 above the number needed to keep up with population growth. The headline unemployment rate went down to 8.1%, but only because discouraged workers are leaving the labor force, so they aren’t counted in the official jobless numbers anymore. All in all, a pretty anemic report. 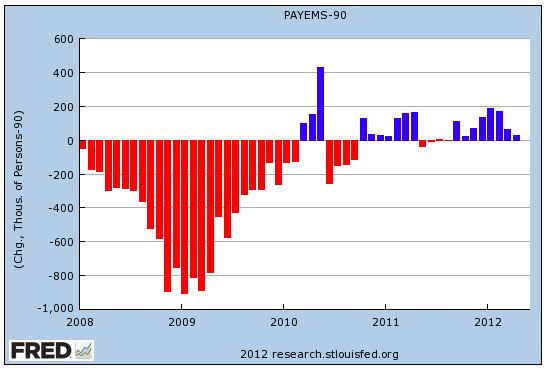 My usual chart showing net new jobs is below. On the bright side, employment numbers for February and March were revised upward by 53,000. This doesn’t change anything dramatically, but it’s certainly better than nothing. Bottom line: it’s only one month, but it sure looks like we’re living through an economy that just can’t quite pull itself into a serious recovery. Since the start of 2011, average net job growth has been 75,000 per month, with only a few months rising above that figure. That’s just not enough to make up for the staggering job losses of the Great Recession anytime soon.